This was a very special bespoke locket for one of our best clients. She wanted us to design and make a piece of jewellery to incorporate part of a ring that belonged to a loved one. She wanted to be able to wear this all of the time, to keep it close. This lady has complete confidence in our work and she gave us an open brief, to make some suggestions. There would have been some very obvious solutions to this commission. But we pride ourselves in original thinking and really creative ideas…….So we designed a ‘box’ in which to contain the item. This would take the form of a bespoke locket. 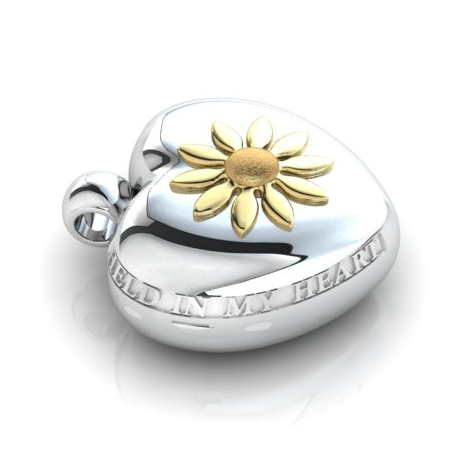 It was made in white gold, with an 18ct yellow gold flower, applied in relief. We understood the depth of feeling behind this piece and suggested a few words that could run around the centre of the locket. We thought that if it was worn on a long chain, it would be easy to reach and touch, so we made it smooth and rounded like a pebble. Our customer was delighted with the final piece and I know that she wears it all of the time, as a constant reminder of her Dad.